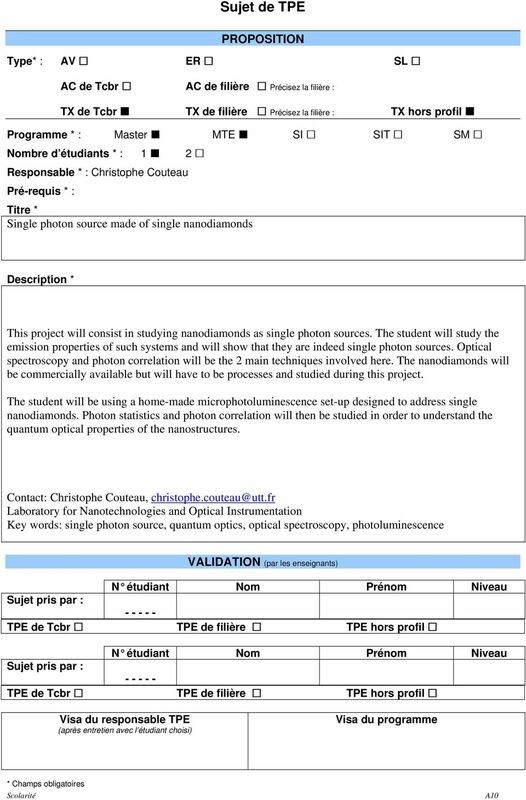 Download "Sujet de TPE PROPOSITION"
1 Single photon source made of single nanodiamonds This project will consist in studying nanodiamonds as single photon sources. 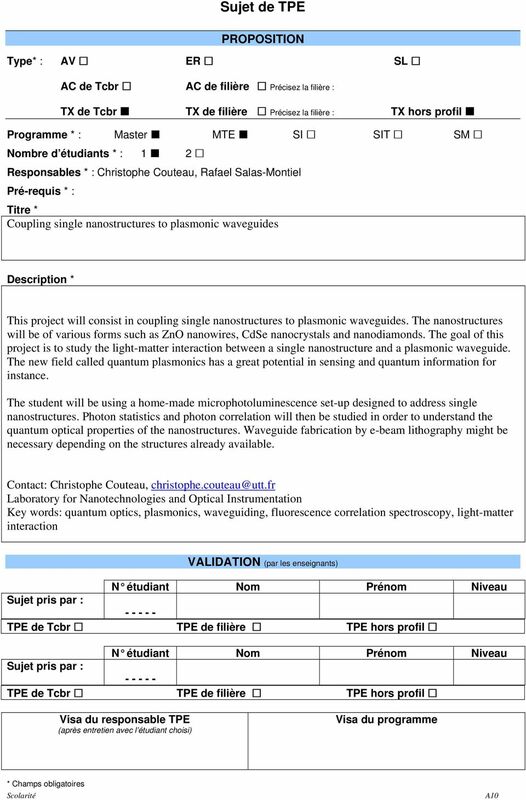 The student will study the emission properties of such systems and will show that they are indeed single photon sources. Optical spectroscopy and photon correlation will be the 2 main techniques involved here. The nanodiamonds will be commercially available but will have to be processes and studied during this project. nanodiamonds. Photon statistics and photon correlation will then be studied in order to understand the quantum optical properties of the nanostructures. 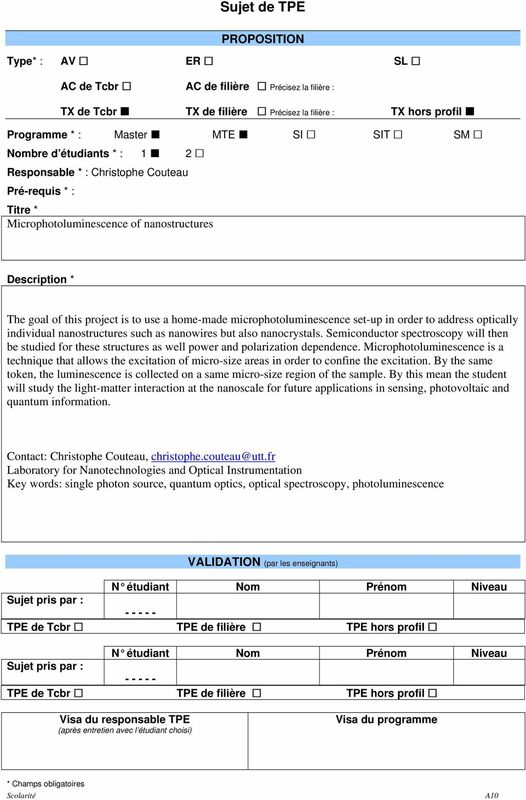 4 Microphotoluminescence of nanostructures The goal of this project is to use a home-made microphotoluminescence set-up in order to address optically individual nanostructures such as nanowires but also nanocrystals. Semiconductor spectroscopy will then be studied for these structures as well power and polarization dependence. Microphotoluminescence is a technique that allows the excitation of micro-size areas in order to confine the excitation. By the same token, the luminescence is collected on a same micro-size region of the sample. By this mean the student will study the light-matter interaction at the nanoscale for future applications in sensing, photovoltaic and quantum information. 5 Nanowire-based photodetector with high gain The goal of this project is to study the photoconductive gain of semiconductor nanowires. Recently, such nanostructures have come across as being very good photodetectors with an important gain (current/light conversion) and could be as efficient as the state of the art commercial detectors. Nevertheless, the true measurement of this photoconductive gain remains unknown and the purpose of this project is to address 2 issues: 1) to use a single photon source for accessing the intrinsic gain of a single semiconductor nanowire and 2) to channel the light efficiently towards the nanowire for efficient detection. 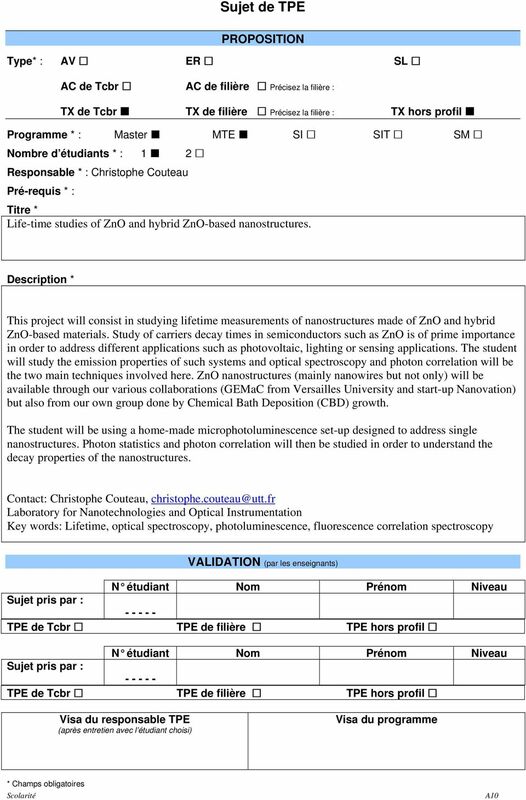 The methods used in this project will be: setting-up a microphotoluminescence experiment at room and low temperatures, contacting and fabricating metallic slots for the plasmonic waveguide and finally measure the gain upon illumination with a faint laser source and a single photon source. 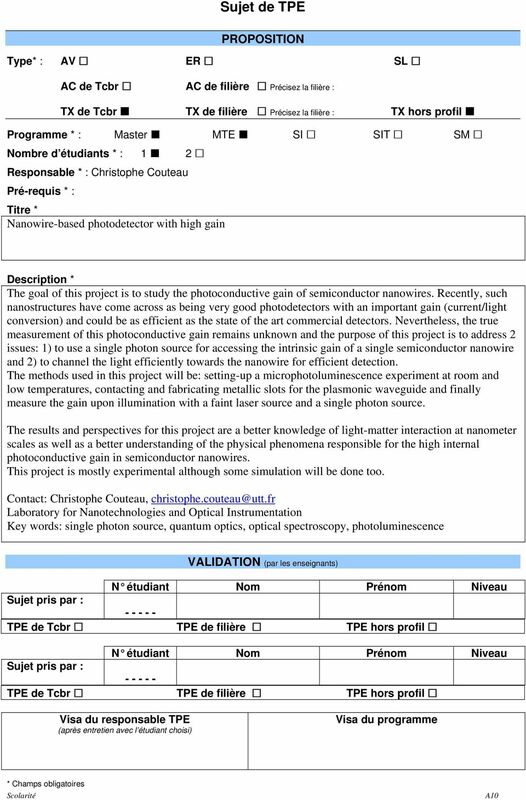 The results and perspectives for this project are a better knowledge of light-matter interaction at nanometer scales as well as a better understanding of the physical phenomena responsible for the high internal photoconductive gain in semiconductor nanowires. This project is mostly experimental although some simulation will be done too. conception des messages commerciaux afin qu ils puissent ainsi accroître la portée de leur message. Population aging : A catastrophe for our health care system?